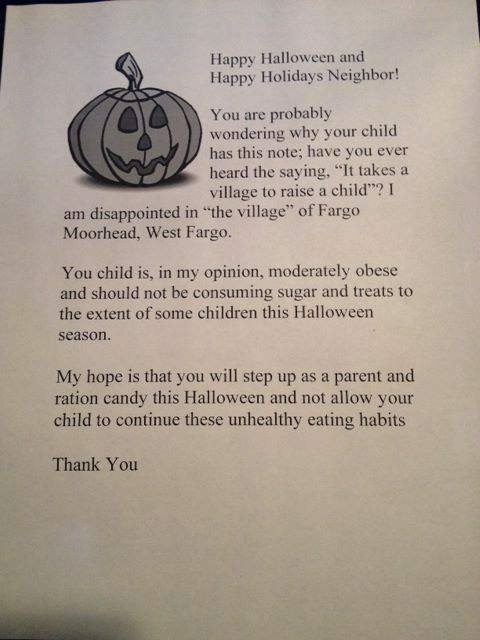 A woman in Fargo, North Dakota will give out letters not candy this Halloween to obese kids who trick-or-treat at her house. I think this woman is way out of line. While it's true obesity is a major issue for American kids and adults, I don't think it's appropriate to give a trick-or-treater a letter telling them they're fat and not deserving of candy. It's not her place and imagine how these kids will feel when they see what the letter says. Why not give all kids, not just the kids she determines are obese, healthy snacks instead, like raisins or popcorn? That way nobody is singled out and Halloween won't be a disappointment. What do you think?